If you follow me on facebook, you know that my youngest son turned four this weekend. We celebrated with a Star Wars party. 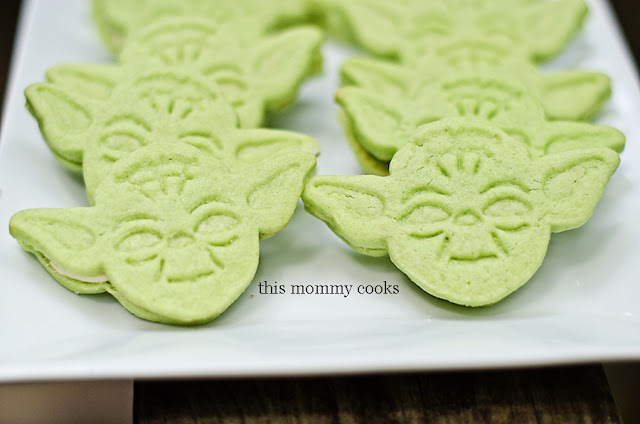 As part of the party favors, I made Yoda sandwich cookies. These cookies were so good!! I can't wait to make some more because I am still thinking about them! The icing is delish too. I used it for the vanilla cupcakes I made as well. So good! I bought the cookie cutters from William Sonoma in case you're interested in buying some too! Sift together the flour and baking powder. In a mixing bowl, beat the butter and sugar until light and fluffy. Stir in the egg, salt, lemon juice, and vanilla. Slowly add flour mixture (1 cup at a time) and stir until mixed. If you're going to add food coloring, add it after the ingredients are all combined. Preheat oven to 375 degrees F. Roll the dough onto a lightly floured surface as thick as you would like your cookies to be. I usually do between 1/4 and 1/2 of an inch. Cut the cookies into shapes and place the cut cookie shape on a parchment lined cookie sheet. Bake the Cookies for approximately 8-10 minutes or until the edges begin to turn golden brown in color. (I baked mine on parchment paper. When you use the parchment paper, and you see any hint of brown, remove them. The tops will still look white, but the bottoms will be golden.) Remove cookies from the oven and allow to cool on a wire rack for at least 5 minutes. This recipe makes about 2.5-3.5 dozen cookies, depending on how thick you make them. When cookies are cool it's time to turn them into sandwich cookies! To make the icing. beat butter for a few minutes with a mixer with the paddle attachment on medium speed. Add 3 cups of powdered sugar and turn your mixer on the lowest speed until the sugar has been incorporated with the butter. Increase mixer speed to medium and add vanilla extract, salt, and 2 tablespoons of milk/cream and beat for 3 minutes. If your frosting needs a more stiff consistency, add remaining sugar. If your frosting needs to be thinned out, add remaining milk 1 tablespoons at a time. Spread or pipe onto one cookie and then place another cookie on top, smoosh it together and voila, sandwich cookies! This icing does not have to be refrigerated, but should be kept in a cool place.